Get evenly steamed artichokes in minutes by using your pressure cooker and this recipe. 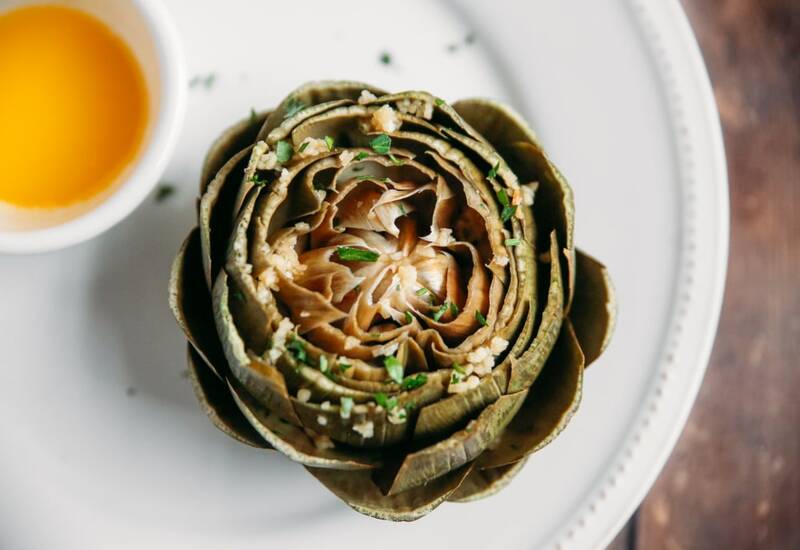 These artichokes are seasoned simply with garlic and lemon to allow the fantastic flavor of the artichoke to be the star of the show. To prepare the artichokes for steaming, cut off the stems so they will sit flat in the pressure cooker. Then, cut off the top third of each artichoke and clip off and discard the sharp points of the outer leaves. Finally, scrape out and discard the fuzzy part on top of the artichoke heart with a spoon or a melon-baller. Rub cut ends of artichokes with lemon. Push a portion of garlic into the top of each artichoke. Pour water into the pot of your pressure cooker. Place steamer rack over the water and put steamer basket on the rack. Arrange artichokes into the steamer basket with points upwards; sprinkle a pinch of salt onto each. Set steam vent handle to Venting to quick-release pressure. Garnish artichokes with parsley and serve warm. For perfectly cooked artichokes, adjust pressure cooking time to the size of the artichoke. Steam small artichokes for 5 minutes, medium for 10, and large for 15 minutes at high pressure. The cooking time does not change no matter how many artichokes you are steaming! Per Serving: 73 calories; 0g fat; 17.1g carbohydrates; 4g protein; 0mg cholesterol; 209mg sodium. I made this recipe and it was really easy! It makes a great appetizer and goes well with dip. I served mine with aioli and my guests loved it. Loved the garlicky flavors in this dish. I used coarse sea salt and it was wonderful. Nice for appetizers and date night. Perfect base for spinach artichoke dip. The artichoke from this recipe with some spinach, cream cheese, shredded Parmesan cheese and had the perfect game day snack.